Stock up for a nice price. Bring your air rifle to life! Designed for maximum efficiency, these Crosman CO2 Cylinders are the perfect for your CO2-powered air rifle or pistol. Includes (25) 12g. CO2 cartridges. Get in on this hotshot deal right now! 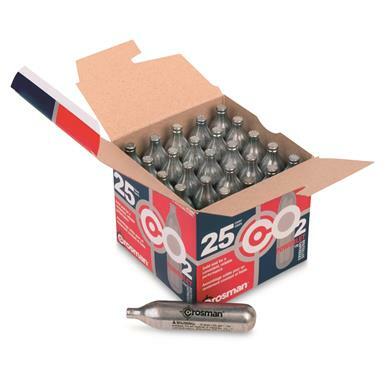 Crosman CO2 Cylinders, 12 grams, 25 Pack is rated 4.8 out of 5 by 24. Rated 5 out of 5 by daverhea from Works Great!! These CO2 cartridges have plenty of power and the price was right at Sportsman's Guide. Also shipping was fast. Rated 5 out of 5 by GrCS from good quality Liked! Rated 3 out of 5 by Kate from Duds I've gone through 3 boxes of these in the past 7 months. No problems. However, this last box of 15 have been a waste of money. So far I have used 6 out of this box and everyone has been a dud. No pressure when tightening into the BB gun. I assume none of the others are any good either. This had to be a bad box of cartridges. Not sure I will buy again. I gave 3 stars because 2 of the boxes worked fine. Rated 4 out of 5 by DaWestMan from Plenty of critter deterrent power! I purchased an air rifle and this multipack of co2 cylinders. The cylinders provide plenty of pulse power and this multipack makes sure there is a good reserve to keep firing, as long as your shooter holds up. Rated 5 out of 5 by Dwight from Good Product They are easy to use and they do their job. Rated 5 out of 5 by intrigued214 from Works as they should Have used these in some of my C02 powered rifles/pistols. They work as they should, seem consistent.